Imagine all the flavors you love from a classic, ice cream shop banana split in the form of a cake. 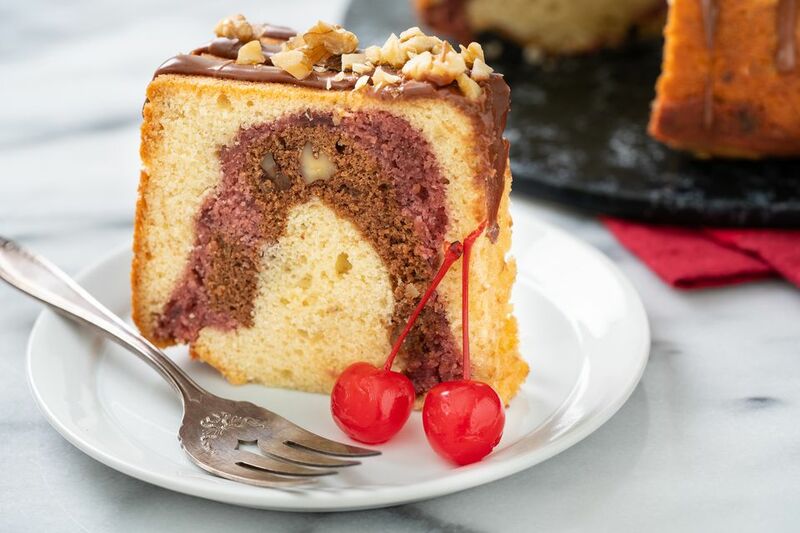 If you dream of sliced banana piled high with scoops of vanilla, chocolate, and strawberry ice cream, and topped with chocolate syrup and chopped nuts, then this cake is for you. In this recipe, the iconic sundae has been transformed into a beautiful tube cake that can be prepared in advance and then sliced and served to guests at your next family gathering. The best part is, you don’t have to worry about it melting! First, mashed ripe bananas are incorporated in a moist and delicious banana cake batter. Then layers of berry flavored cake and decadent chocolate cake mimic the signature dessert. Finally, the cake is topped with a drizzle of chocolate icing and sprinkled with chopped walnuts. Of course, you can certainly serve this cake with a scoop of vanilla ice cream. Whatever you do, don’t forget to serve this Banana Split Cake with a cherry! Heat oven to 350 F. Grease and flour a 10-inch tube pan; set aside. Cream sugar and 1 cup butter together in large bowl with an electric mixer. Combine mashed banana with sour cream, milk, and vanilla; set aside. Add to creamed mixture alternately with the banana mixture, beating until well-blended. Put 1 cup of the batter into a small bowl; stir in the preserves and food coloring; set aside. Put another 1 cup of the vanilla batter into a different bowl, stir in the melted and cooled chocolate and 1/4 cup of the walnuts; set aside. Spoon half of the remaining plain batter into the prepared tube pan. Spoon the strawberry batter over the plain batter and smooth the top. Top with the chocolate batter and carefully smooth over. Top with the remaining plain batter and carefully smooth over. Bake for about 1 hour 15 minutes, or until a tester inserted comes out clean. Cool in pan for 10 minutes on wire rack, then remove from pan and cool completely on rack. For the chocolate icing: In a small pan over low heat, melt together the 1 ounce of chocolate and 1 tablespoon of butter until just melted. Remove from heat and quickly stir in the 1/2 cup powdered sugar and 1 tablespoon water until it is smooth and glossy. Drizzle immediately over the cooled cake and sprinkle on the remaining 1/4 cup of chopped walnuts. Slice and serve topped with maraschino cherries and enjoy!